These valves are designed for those looking to upgrade to a aftermarket high flow replacement valve set for their 2.3 head build, without the added machine work involved when going to oversized valves. These valves are the same valves we have used in record holding NHRA stock class race cars. 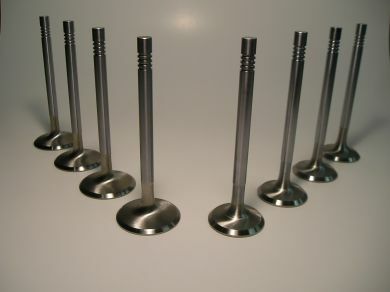 The valve shape and the additional special back-cut angle machined into these outflow stock units across the board by a considerable amount and the EV8 stainless alloy is designed to handle the harsh environments of turbocharged engines just as well as the factory turbo valves. Please specify your valve lock type, the multi-groove are a factory replacement style where as the single groove lock is more suited for high performance applications. You will need to purchase our single groove valve lock set in addition to utilize the single grove lock option valve.